Today I'm drinking Little Hump Spring Ale brewed by Highland Brewing Company in Asheville, North Carolina. 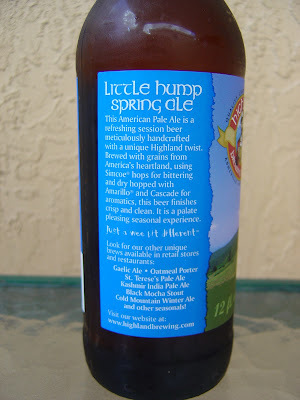 The label has a simple rural, spring, mountain scene and a description on the back. One of their catch phrases seems to be, "Just a wee bit different". 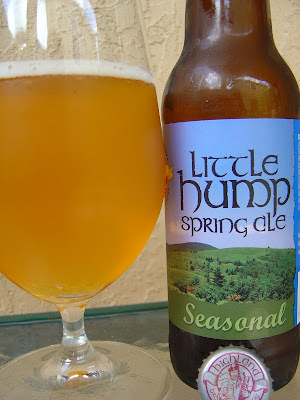 The aroma is pleasant: grain, fruit, and hops. Bitter citrus flavors waste no time getting your attention and once they disappear, you are left with some dry, medicinal flavors left behind. Quite hoppy and grassy! At the same time, very thin. There is no fruitiness or other balancing sweetness to speak of and those off flavors just keep hanging around. Crisp for sure, perhaps refreshing, but I can't get past the unpleasant taste.